These restaurant breweries are equipped with the brewhouse BREWORX CLASSIC 2000 and set of special pressure vessels with volume 2000 liters for the fermentation and maturation process . Brewery’s production capacity from 1500 to 6000 hectoliters of beer per year. 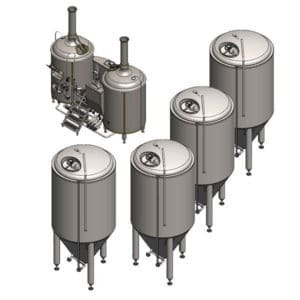 These restaurant breweries are equipped with the brewhouse BREWORX CLASSIC 2000 and set of special pressure vessels with volume 4000 liters for the fermentation and maturation process . Brewery’s production capacity from 3000 to 12000 hectoliters of beer per year.